The data cart is a way of building up a custom spreadsheet, with data from one or more datasets. 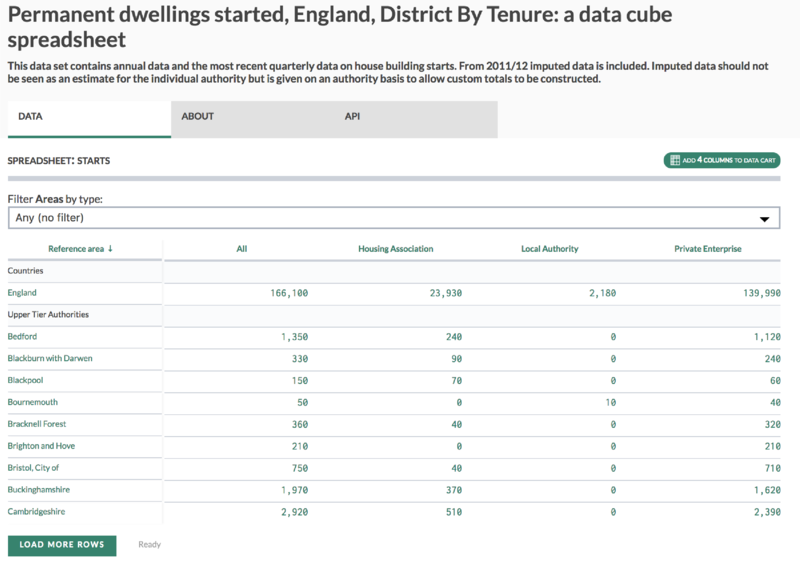 You can choose both rows and columns, and end up with is a spreadsheet which cross references statistics (columns) against geographical areas (rows). We can then download or share this custom spreadsheet. This is what an empty data cart looks like. Click on the Data Cart tab at the top of every page. To build up your cart, need to add rows and columns to it. To do this, you need to find datasets and areas that you are interested in, and add data from them to the cart. 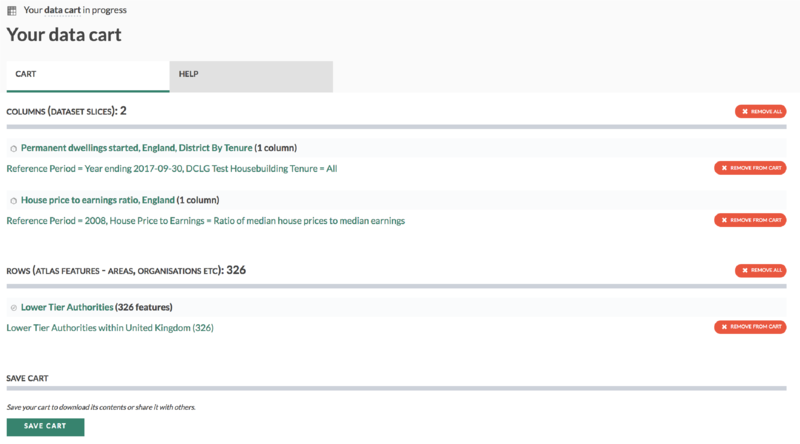 Say, for example, you wanted to get data for the ratio of median house prices to median earnings, and the number of dwellings being built across the country, so that we can compare them in excel, or show them in a GIS: you can use the Data Cart to do this! First, find the two data sets that you're interested in, and narrow down the dataset until you see a spreadsheet view. We can then repeat the above steps with the dataset ’House price to earnings ratio’, and we’ll have 2 slices of data in the cart. Note that adding columns doesn't add any actual data yet, but it records the fact that you're interested in those columns. For the cart to return data you also need to tell the cart tool which rows (areas) you're interested in. 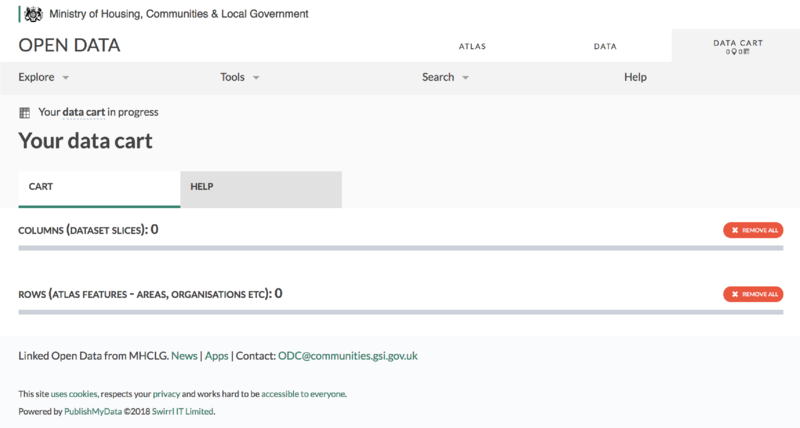 From the bottom of this list , we can use the add to data cart button to add all local authorities to the cart. There are a variety of different ways of adding data to a cart, but we've just demonstrated the simplest way. It is also possible to only add specific geographical areas, or choose to add all columns from a particular dataset in one go. Look out for the buttons with a shopping cart and plus sign! Once we are happy with the content of our data cart, we can press Save. This will save this version of the data cart, ready for us to download or share. Note: Once you've saved a cart, you can't edit it again (so that the contents stay consistent for anyone you've shared it with!). However, you (or anyone you've shared it with) can add rows and columns from a saved cart into your new (empty) in-progress cart. To share a cart, you can just send someone (or share on social media) the link under the "Share" heading. This particular one is: http://opendatacommunities.org/carts/d1b89204-e234-43fb-aa02-11d284305e6d. This URL will never change. To download the data in your cart as CSV, click the CSV button. The download is returned with the areas as rows, and the dimension values as the columns.